Slip into this two-piece short homecoming dress by Dave & Johnny for a gorgeous look at your semi-formal event. From the gleaming off-the-shoulder crop top to the vibrant floral-print skirt, this beautiful short satin ensemble is certainly a head-turner. The v-neck bodice has banded sleeves that drape seductively over the arms, and bold shoulder straps to provide stability. Abstract pink and purple flowers are splashed across the short white a-line skirt like paint on a satin canvas, while wide pleats and a tulle lining create volume for a fun and flirty look on this short party dress. 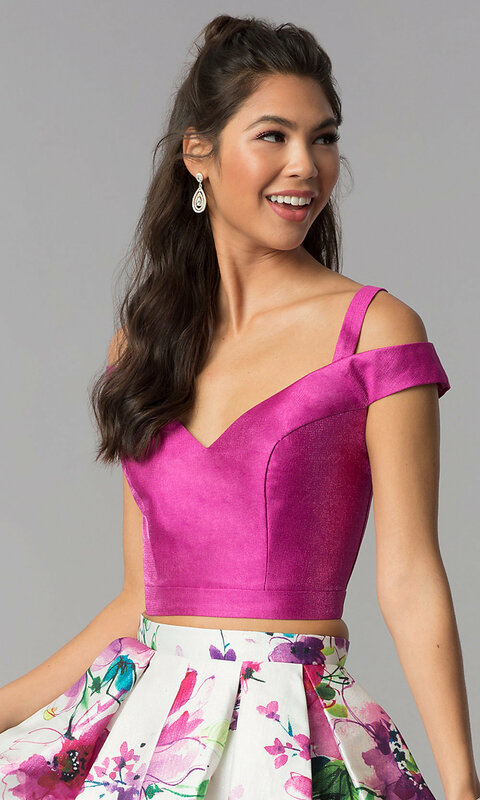 Equally impressive as a wedding-guest dress or short prom dress, this two-piece short homecoming dress has convenient side pockets that complete the eye-catching look.